The baroque church of the apostle St. Barholomeus is first mentioned in 1363. Nothing is known about the organ in those times. It is only in the first half of the 17th century when the organ is mentioned. It was built in 1627 and is preserved until today. The picturesque renaissance instrument is even available for Hauptwerk. During the course of the history the musical taste changed several times. At the year 1787 the old organ was sold to the nearby Kruh and replaced by baroque instrument. But even this masterpiece seemed not to fit the needs of the "modern" music at the beginning of XXth century. The inhabitants decided to replace the organ once again. 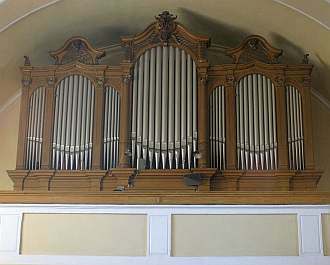 In 1932 an organbuilding factory Rieger built a new instrument with pneumatic action and with 28 stops, opus number 2 533. It reflected the "romantic" taste of the time. The organ was seen as an imitation of an orchestra. For this reason it is sometimes called "symphonic" organ. There are almost no brilliant aliquotes characteristic for older organ schools, while there are many dynamically contrasting stops, imitating various musical instruments (oboe, piccolo, flutes, trumpet, cello, violine ...) based all in the 8' foot fundament. The sound of the organ is therefore less brilliant than that of a baroque instrument, but on the other hand it has enormous colouring possibilities. The intonation of stops is made so that they blend togehter very well forming many different sound colours each time combined differently. The sound of a "symphonic" organ is familiar to many organists in the world since from the last decades of the XIXth century until, let us say, IInd World War, it was the leading type of the organ and the organbuilding then was flourishing. So, many german, czech, french, even italian and spanish organs were rebuilt during that period by large organ factories, what is not always seen as positive since too many really historically significant organs fell victim to the taste of the industrial era. In the case of Rieger op. 2 533 which is now available for Hauptwerk, we encounter a typical representant of that organ building school. Medium sized, two manual organ made by large and proliferous organ factory which is active worldwide until present days. With Doksy-Kruh and Doksy-Rieger sample sets a Hauptwerk user has unique possibility of comparing the sound of historical Doksy-Kruh renaissance instrument with the sound of the instrument which in the course of history took its place in the same church. A responsible judgement of the aesthetical and craftsmenship value can then be made through comparison of the two sample sets. Further reading: Tomáš Horák, Varhany a varhanáři na českolipsku. Česká lípa, 1996. A number of direct, superoctave and suboctave couplers available as well as a number of generals.